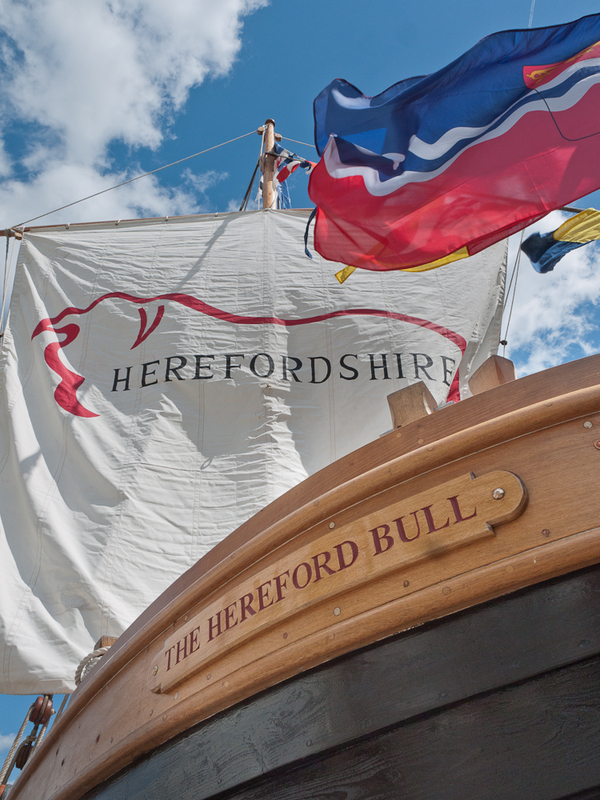 The Hereford Bull, a new boat built by T Nielsen in the traditional style of a Wye Trow, was named at a ceremony in Hereford City centre on 12th May. The Trow included timber from our OneOak project, which was used to make the Transom Beam. Following last week’s news that a beam from the OneOak tree was taking centre stage at the major historical event which was the Queen’s Diamond Jubilee pageant (read post), one of our readers saw our clarion call for any photos of the Hereford Bull trow taking part in the flotilla. We are very grateful to Julie Morgan for sending in these photos. This Sunday, 3rd June, look out for the Herefordshire Bull – a traditional Trow built to take part in her Majesty the Queen’s Diamond Jubilee Pageant on the River Thames in London. 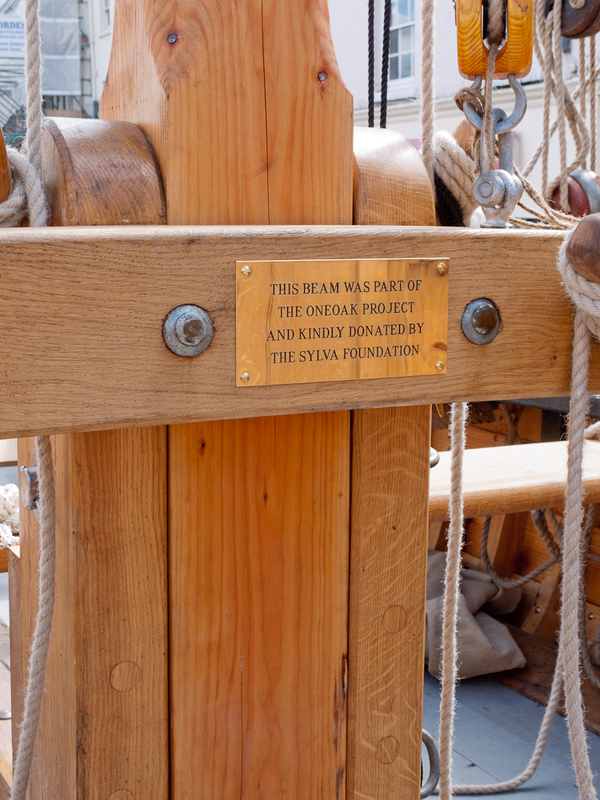 Regular readers will know that the transom beam of the boat was made from the timber of the OneOak tree, and you can read the stories here. If you are lucky enough to be there we’d be really keen to receive any photographs of the Herefordshire Bull taking part in the flotilla. Find out more, including a map of the route with timings, by exploring the interactive map below. Some OneOak timber has been used in the building of a Trow by traditional shipbuilders in Gloucester. The ship will sail in a flotilla of one thousand ships on the River Thames in June, to celebrate Her Majesty the Queen’s reign of sixty years. 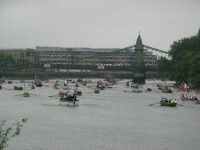 The Pageant on the River Thames will celebrate the Diamond Jubilee, where one thousand boats will pass from Battersea Bridge to Tower Bridge on Sunday 3 June, led by Her Majesty’s barge. 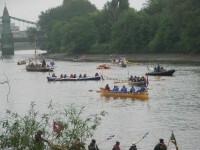 Boats taking part in the pageant were selected by invitation and by an open submission process. A boat representing each county of the United Kingdom was entered. One of these was for the county of Herefordshire. A ‘Herefordshire Diamond Jubilee Fund’ was established through private sponsorship, which allowed the group to commission a ‘Trow’. The Trow was flat-bottomed barge with a shallow draught, powered by sail, drawn by horses or, more usually by gangs of men known as bow hauliers. 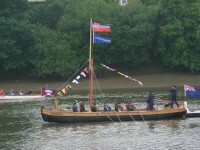 In the 18th and 19th Centuries it was a poplar ship design for transporting goods on the Rivers Wye and Severn. Trows were used to move many different cargoes including coal, wood, cider and wool. Only one complete Trow (a River Severn Trow) remains in existence, which can be seen at the Ironbridge Museum in Shropshire. The new trow is being built by T Nielsen & Co; traditional shipbuilders at Gloucester Docks. Douglas Fir and Oak timber has been donated from several Herefordshire estates, and has now been joined by our OneOak beam. Following a design created by maritime historian Colin Green, author of ‘Severn Traders’, the Trow will be 11m (36’) long with a 2.75m (9’) beam. 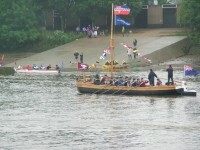 It will be finished in Spring 2012 in time to be tried and tested and for a crew drawn from the county youth to be trained to take part in the great pageant on the Thames in June. 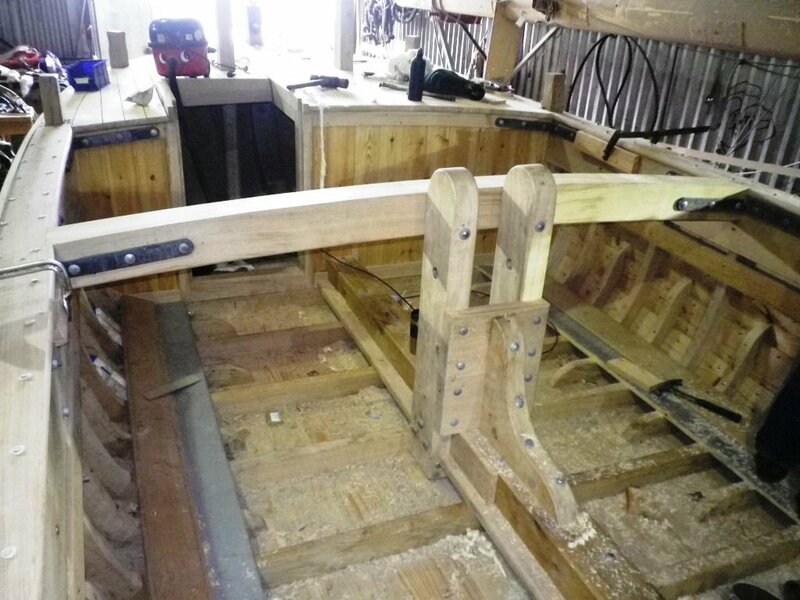 The trow will have 8 oars and will later be fitted with its mast when it no longer needs to pass under low bridges. It is to be named The Hereford Bull in a ceremony in May. Building the Trow at T Nielsen's yard in Gloucester. Photos Andrew Wynn. The piece of OneOak has a prominent place in the Trow, where it provides structural strength and support for the mast.